They’re hardly comparable to the giants of NFL and NCAA. But at the same time these stadiums are a sign of where ‘soccer’ is heading in the US. Because have you seen a stadium with 35 training fields?! Over the last several hours we’ve added 4 new stadiums to StadiumDB, this time from the American NASL, second tier in their league system. Worth keeping in mind, in the US there’s no promotion or relegation based on results on the field, rather based on financial and marketing potential of a club/franchise. That’s why each of the stadium’s you’ll see today would have to see major changes to be awarded MLS status instead of NASL. Here’s how the second league is looking at present on these four examples. More from the NASL to come in the future. New stadium in northern Fort Lauderdale was built in 1959 to provide American football and track & field facilities for four local schools. Academics remained in charge of it for nearly two decades, until Fort Lauderdale Strikers moved in as secondary tenants. The football/soccer team began a very rich history of this discipline in Fort Lauderdale, hardly matched by any other venue in the US. Though Strikers relocated several times to other places, in 1998 thorough reconfiguration of the stadium to ‘soccer-specific’ was done. Back then for the soon-defunct Miami Fusion MLS team, later for the Strikers again. The redevelopment made Lockhart Stadium the first one in the US to become soccer-specific, preceding the new home of Columbus Crew by several months. In 2015 some seats were replaced by new ones in yellow-red colours, matching those of the Strikers. Named after former city commissioner H. Y. "Doug" Lockhart, the stadium also played host to various other soccer events, including officials games of the USA like that against Mexico in 1980, when the hosts managed to beat southern rivals for the first time in 46 years. Located in a woodland area east of Cary, this football/soccer complex was one of America’s best when opened entirely in 2002. Main stadium was able to hold 7,000 people at that point with single-tiered stands on three sides (north end open). 5 full-sized training fields were built alongside the main one. First users, unfortunately proving short-term tenants, were the women’s team Carolina Courage and Cary Clarets. Eventually only the NCAA soccer teams of NC State University Wolfpack and NASL side Railhawks managed to stay here longer than 7 years each. Thinking of the complex’s development, expansion was carried out in 2011, adding 1,500 seats in the north end and a new upper tier with also 1,500 seats on the east side. This way the stadium holds 10,000 people and also has new player facilities added. If this stadium looks too modest for a National Sports Center, that may be a very correct impression. Because it’s not about the main stadium in this case, but about creating the most extensive football/soccer complex throughout the US, open to both amateur, youth and professional teams. From 1987 to 1990 dozens of football fields were created here. Over 50 if including half-sized fields and 35 in full-size configuration. To show the scale – that’s enough fields to simultaneously host training sessions of all teams participating in the FIFA World Cup. Spanning over 2.4 square kilometers, the complex was created with initial funding of $14.5 million by the state of Minnesota. To this day its publicly-owned and operated non-commercially, enjoying a stunning 3.8 million visitors per year! Aside from the football fields, you’ll find indoor halls, velodrome, lacrosse, baseball and other sports facilities here. The main stadium itself wasn’t always soccer/football-specific. It was in fact an athletic stadium with running track. Nowadays the track doesn’t exist, while soccer field was moved closer to the only permanent grandstand in the west. East side is occupied by small temporary stands. Current capacity of 8,500 is somewhat underestimated, because largest crowds here were far beyond that number, topping at twice-the-size turnout for USA-Canada women’s game in 2001. Female national teams as well as youth selections use the complex regularly, but it’s football clubs that make up for most of the matchday calendar. First Minnesota Thunder, then Stars and eventually also United FC all played home games here. Sporting history of this place began beck in 1923, when first baseball game was held here. From 1947 it functioned as a professional stadium able to hold major games. In 1976 the existing main grandstand in the north was built and MLB teams were flocking here for their pre-season training games. Thanks to these “exhibition tenants” the stadium gained quite a reputation for off-season baseball. This wouldn’t have happened with promotion efforts by Al Lang, who in return received patronage over the stadium. 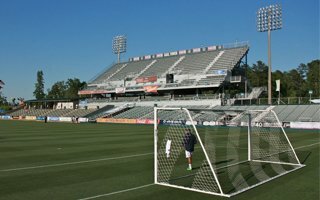 But despite the reputation there was no solid tenant to provide constant use for the stadium until 2011, when soccer team FC Tampa Bay (later Rowdies) moved here. The second league club celebrated their first NASL Championship here and strengthened their position enough to force banning baseball from the building. Pitch conversion from baseball to soccer and back was negatively affecting the field’s state. In 2014 the stadium was converted to soccer-specific and equipped with temporary stands along the western side. Eventually building a brand new 18,000-capacity stadium might be possible here.